The Happy Hollisters make everyone happy! Children like reading them because—simply—they’re fun to read! Parents appreciate the wholesome family values and character-building potential. Teachers and librarians hail them for their rich, engaging vocabulary and value in initiating good reading habits. Why not let your child in on this uniquely worthwhile experience? 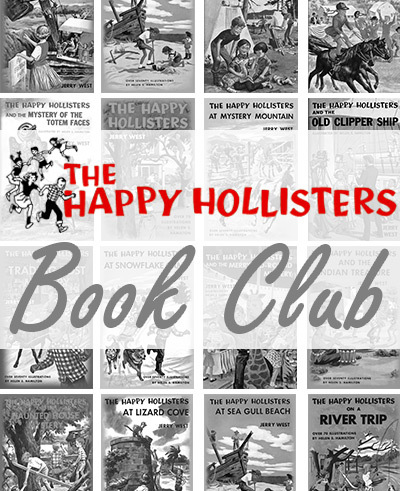 Start your child in The Happy Hollisters Book Club for just $1.95! That’s an initial savings of over 80%! Act now, and we’ll send your child The Happy Hollisters, volume 1, for just $1.95 (free shipping is included within the U.S.) If he or she loves the adventures, there is nothing for you to do. Sit back and we will send two new Happy Hollister paperback books every 4-6 weeks and bill you at the special book club price of just $9.95 each—shipping is always free to U.S. addresses. That’s a savings of over 80% for the first book and then over 15% every month thereafter!. There are 33 books in the series, but there is no minimum number of books for you to take. You can discontinue your child’s membership at any time simply by notifying us. You can even cancel immediately after receiving the very first book if you wish—but volume 1 is still yours to keep for just $1.95! You have nothing to lose, and your child has everything to gain—a new world of reading enjoyment and the beginning of a valuable habit that will last a lifetime.